From "Max Ernst: A Retrospective," p.71, edited by Werner Spies & Sabine Rewald, published by the Metropolitan Museum of Art & Yale University Press (2005 citing a manuscript in a private collection; George Charbonnier, "Entretien avec Max Ernst" enregistré le 4 avril 1950. This double exposure, Max Ernst, 1946, is probably the most recognized work by the master photographer, Frederick Sommer. 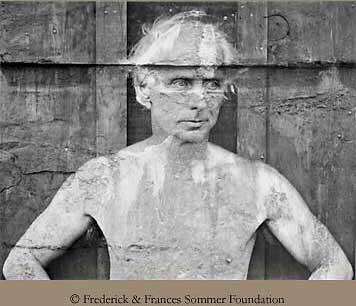 Printing two separate 8x10-inch negatives onto a single sheet of photographic paper makes Frederick Sommer’s famous portrait of Max Ernst, 1946. 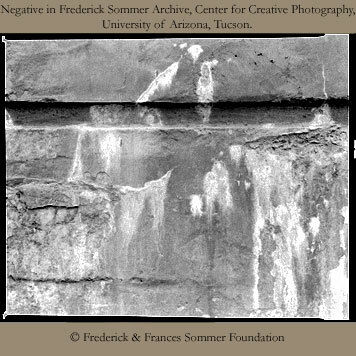 This proof print is from the negative of a portrait Fred took of Max standing in front of the bat and board exterior of Ernst’s Sedona cabin. Sommer was not satisfied with this image; Max had kept his head perfectly still during the one-second exposure, but had taken a slight breath, creating areas of soft-focus in his chest and shoulders. 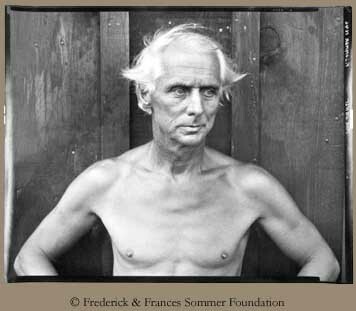 This proof is from the second negative that comprises the portrait of Max Ernst, 1946 by Frederick Sommer. It is a photograph taken of a cement wall near Prescott, Arizona. The white marks (efflorescence) are created as water seeps through the cement and evaporates. Sensitive to found drawings in nature, Sommer recognized this interesting abstraction. 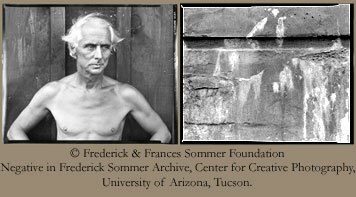 “We must honor gravity on all occasions” Frederick Sommer. Printing Max2 with Frederick Sommer, 1991, “Watching this double exposure print develop was a wonderful visual experience,” Naomi Lyons (assistant to Sommer, 1985-1999). The wall negative was the first exposure, 30-seconds at f/8 (Omega D2 enlarger with a ground condenser lens and 150w bulb), on Chlorobromide gelatin silver paper (Forte Fortezo). This negative was remarkably dense and still contrasty. The exposure required extensive dodging and burning along the edges, particularly on the bottom. Once all this work was done, the wall negative was removed and the Max negative placed in the printing frame. The paper (already exposed with the ‘wall’ negative) is positioned, slightly askew on to the Max negative (there were three generations of registration devices attached or bored into both of these negatives) and exposed for 19-seconds with a moderate dodge followed by minimal burns. The paper developer, a simple Amidol formula was used half-strength at 70°F (full strength formula 1L = 30gm Sodium Sulfite, 6 grams Amidol, .8 grams Potassium Bromide). Developed in a slightly larger than 8x10-inch tray, with minimal agitation for 1-minute 20-seconds, it was then placed in a clean water bath (86°F) for 40-seconds. After examining the print dry, Sommer used Farmer’s Reducer to fine tune his silver prints by removing densities in specific areas with masterful brushwork.